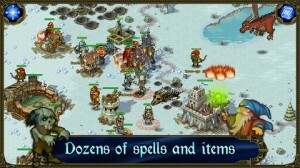 Majesty: The Northern Expansion is an iPhone game developed by HeroCraft Ltd. You might recall some of the other HeroCraft titles for iOS that we’ve reviewed this year, including Gibbets 2, Tiny Bang Story, and Boulder Dash XL. As you may remember, I’m not a huge fan of the strategy genre. Case in point: I love “The Walking Dead,” but I have pretty much zero interest in “The Walking Dead: Assault,” vastly preferring “Walking Dead: The Game.” Of course, that doesn’t mean I hate strategy games on principle. One of the games I loved best so far this year was a strategy title called Cartoon Defense.I was completely taken by surprise when I played it: it was so addictive! So. Majesty: The Northern Expansion. 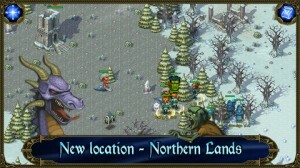 It’s a pretty typical-looking fantasy strategy title, with a wintry landscape that’s quite beautiful (and changeable!) There are dragons, archers, magic users, and some pretty sweet golem monsters. It’s the dragons that are at the center of the story, however. 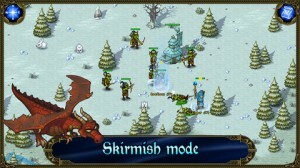 If you played the original mobile game “Majesty: The Fantasy Kingdom Sim,” you’ll probably really enjoy Majesty: The Northern Expansion, which lets players continue their conquest in a new snowy location. Not everyone has had good things to say about this Majesty incarnation, however. One very angry user who had played the game previously on his PC argued that the port of this game to iOS was deeply, and perhaps intentionally, messed up. Having not played the PC version myself, I’m not sure if he’s right. That being said, I didn’t necessarily feel the same way about my own armies, though perhaps it was because I didn’t play deep enough into the game. One thing that did bug me was the size of some of the in-game text: far too small, and strangely colored, for me to read with ease on such a small screen. Majesty: The Northern Expansion features suitably epic music, a cool environment with fun graphics, and a traditional strategy gameplay experience. 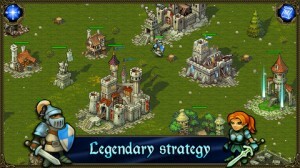 I think the tutorial is really strong, and the game is a ton of fun (and I’m not the biggest strategy game fan.) If you love strategy titles, definitely give this one a spin. 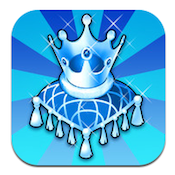 Majesty: The Northern Expansionis compatible with iPhone 3GS, iPhone 4, iPhone 4S, iPhone 5, iPod touch (3rd generation), iPod touch (4th generation), iPod touch (5th generation) and iPad. Requires iOS 4.3 or later. This app is optimized for iPhone 5.